A classic precious gemstone in the color of love provides a sense of timeless glamour to this romantic 14K white gold engraved hearts ruby engagement ring. A 6.5mm round ruby rises regally in a four-prong setting from this sophisticated piece; this eye-catching stone presides over the row of tiny hearts that's carved into the 14K white gold band and framed with petite milgrain edges. Craved swirls adorn the sides of this sweetly-styled piece in lively fashion as they add extra elegance. 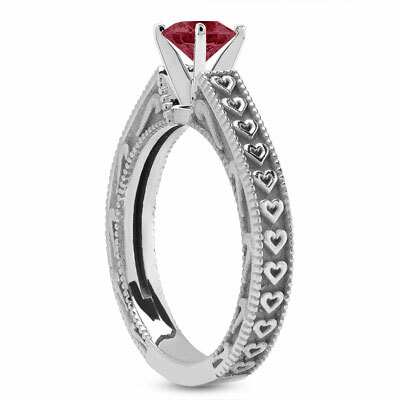 A 5mm ruby is set in a 14K white gold setting with a heart design. 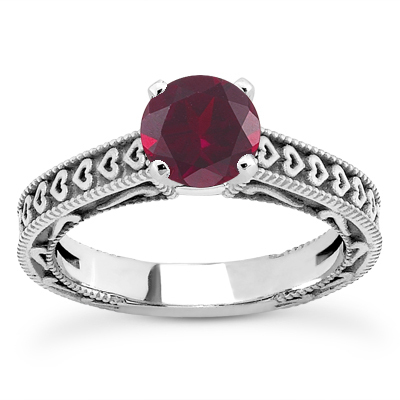 We guarantee our Engraved Hearts Ruby Engagement Ring to be high quality, authentic jewelry, as described above.